New Paperless Online Application: NO Paper, NO Mail. Open an Account on Your Touchscreen Device in 3 Easy Steps! In order for investors around the world to have the access to international investing opportunities, SogoTrade offers Foreign Accounts. This gives customers abroad the ability to trade international equities. It takes only 5-minutes to open an account. You do not have to travel around the globe to allocate assets worldwide! With SogoTrade, you can trade online wherever you are! Go to www.SogoTrade.com and click "OPEN AN ACCOUNT"
Submit your application and you're done! Am I qualified to open an international brokerage account? I am a resident of the U.S., Can I open a joint account with my relatives in a foreign country? No. All account holders must have the same status. Is there a time restriction to opening an account? No, all customers can open an online account with SogoTrade at anytime. Is there an age restriction to open an account? In order to open your own brokerage account, you'll need to be a legal adult (usually 18 years old). It only takes approximately 5 minutes to complete the online application and 1-2 business days for us to fully activate your account. How many accounts can one person open at SogoTrade? SogoTrade only allow one Margin account per customer. Can I have my friend, my representative or my lawyer sign for me? What is the procedure to open an options account and trade options? You can add options trading feature when you submit your online appplication. If you did not apply for options trading when you first opened your account, you can do so at any time. Submit your options upgrade request online by logging into your SogoTrade account or complete and e-mail us the options application form. Should I use English on the application? All application must be completed in English unless you are using the Chinese interface. All signatures must match your signature on your passport/ID. Does SogoTrade allow third party funds transfer? No. SogoTrade does now allow third party funds transfer. 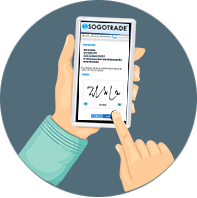 Does SogoTrade charge different fees for an international brokerage account? No. Our commissions are the same for international accounts. Please go to our Commission Rates page for more information. Can I authorize my friend or relative to trade for me?